Join Rachel, Kirsty and Zainab for some squishy toy fun! Zainab the Squishy Toy Fairy's special magic makes sure everyone has fun playing with squishy toys. But when her magical object goes missing, squishies everywhere stop bouncing back! Could this be the work of naughty Jack Frost? Rachel, Kirsty and Zainab must help put things right. Daisy Meadows (Author) The Rainbow Magic and Magic Animal Friends books are written by a small collective of authors under the name Daisy Meadows. 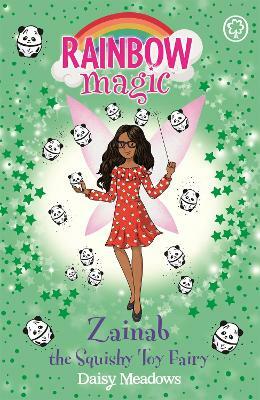 Rainbow Magic is the no.1 bestselling series for girls aged 5 and up with over 30 million copies sold worldwide! Learn more about the books at www.rainbowmagicbooks.co.uk (where you can download the Rainbow Magic Reading Challenge poster) and www.magicanimalfriends.com (where you'll find fun animal activity sheets) Georgie Ripper (Illustrator) Georgie Ripper was born in London and is a children's book illustrator known for her work on the Rainbow Magic series of fairy books. She won the Macmillan Prize for Picture Book Illustration in 2000 with My Best Friend Bob and Little Brown Bushrat which she authored and illustrated.